Did anyone catch that we put an “Easter Egg” within the tree? Kudos to the first person to spot it. Inside cup handle at base of tree in front of the little green package wrapped with a red bow. The egg is darker green than the package behind it. I’m thinking the term “Easter Egg” may be confusing some people. Correct me if I’m wrong, but I think you were referring to the Easter Eggs that are hidden within video games and DVDs. That kind of Easter Egg is something unusual that’s a special surprise for anybody observant or diligent enough to find it. In this case, I’m thinking you’re referring to one of our 72 team members that isn’t really … um … real. If so, Joe is the closest thus far. Yes, the “non-human” was the Easter Egg. Could it be the @ on top of the tree? The fingers on the little cartoon man with the thumbs up looks like three small eggs. The Easter egg is seven rows down on the right. Barb, I think that’s a kitty, lol. It was actually “Gary” our stick man from the videos. But, that “Kitty” was actually a nerf gun that one of our Developers was holding. Five rows down from the top – picture on the right side. It looks like an Easter Egg inside the handle of the cup labeled EzineArticles placed in front of the base of the tree. It’s a darker shade of green than the package behind it. It is inside the cup handle which is at the base of the tree in front of the little green box with the red bow. The egg is darker green that the parcel. That is the Easter Egg. Ok… own up… who’s eaten it? Thank you, Merry Christmas to the EzineArticles team. Great idea. Yes it is in 5th row. Thanks Chris and your team for inspiring me to be an author. Wish you all Merry Christmas and Happy Holidays! something in that photo. Its my guess. I wish my pic was on top. I think the egg is nine rows down,second from right and it’s red. Looks like 5 rows down to the right. 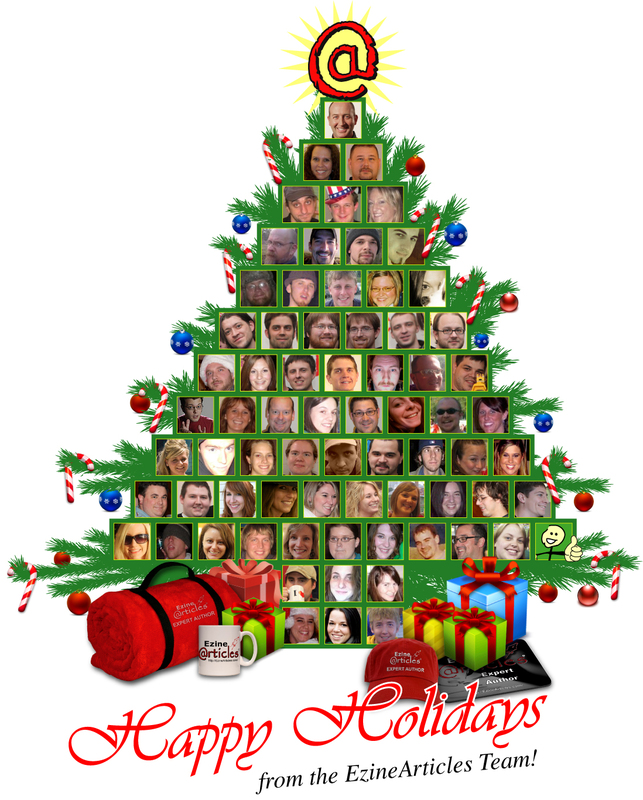 Happy holidays to the fantastic EzineArticles team. Hope you all get some well deserved time off! I did the same thing you did,, duh, it was right there. God it’s so obvious. It’s that picture at the top of the tree. Oh no that’s not an egg that’s Chris. Sorry Chris I just couldn’t resist that one. Actually still looking for it. Hey I really did find it I think. It’s the @ symbol at the top of the tree!! oops looking over the comments it looks like Jerry already got it before me. Merriest Christmas Tree ever seen! Beautiful! HAPPY HOLIDAYS! Only me immersed in non stop work. No articles in 3 months. Cheers! For the New Year, of course! Merry Christmas and Happy New Year to EzineArticles. Wow! what a good looking Christmas tree. Looking forward to great writing in 2010! I guess I’ll have to withdraw my selection of it as being inside the handle of the cup with the EzineArticles imprinted on it at the base of the tree, because when I enlarged it, I could see that you really are looking at the green package through the cup’s handle, as I can actually see the bottom of the package within the space circumscribed by the cup’s handle. However, I don’t see anything else that looks more like an Easter Egg on that tree than that does. Linwood, Good thing you withdrew that selection, can I have rights to it? lol. I am goin to let mine ride, lol. Have you read comment number 5? Wishing the team Happy Holidays! Thanks, all, and Merry Christmas! Wrap yourself in the warmth of Christmas in the chilling weather…It is the warmth of your heart and soul which brings a melody in Christmas that is to last forever. Its Christmas time – a feeling of a magic wand going over you! Everything shall become softer, subtle and more beautiful this season. This Christmas tree is very nice! Original and beautiful! Like this we can see how many people work for EzineArticles and how much work there is that we authors can post articles. May you all have blessed Christmas and a very happy and prosperous 2010. Thank you The tree is beautiful. Wow! Creativity to the highest level. Anyways, thank you great people for your great works. May this season be the merriest. Looking forward to more meaningful interactions in 2010. Merry Christmas and a Happy New Year to a good looking bunch of ‘ornaments’, even Gary! Wow: wonderful,wish u All Merry Christmas and Happy new year.I feel proud of being in EzineArticles community. I have been an infrequent author at EzineArticles till now. EzineArticles rocks, I haven’t so far. Just wait, 2010 is going to be THE YEAR for me. MERRY CHRISTMAS TO EVERY ONE AT EzineArticles! Thanks guys beautiful tree ~~ The Easter Egg I believe is w/in the handle of the EzineArticles Mug. Merry Christmas Everyone!!! Interesting diversion looking for an “Easter Egg.” Even funnier to learn it was a word play — the stick man is an Easter Egg? I am still trying to get to the intelligence behind that analogy. I guess I am not gonna get the humor of it. Oh well, plenty else to keep me occupied. Looking forward to a more productive year in article writing. Plan to begin promoting our Webinar program through article writing. Ought to be fun, eh? I spotted the Easter egg in 5 th roll to the left hanging fron the TREE. Wish all the happy Ezine Marketing family a very merry Christmas and all the very best for 2010. This is a good team effort! A very warm Christmas tree for all of us. Happy holidays to all of you too!